Elderly Neapolitans remember "the Mostra d'oltremare when..."—perhaps when it was first opened on May 9, 1940 by king Victor Emanuel III as a showcase for Italy's imperial designs in Africa; or maybe when they rode the suspension cabin–lift when it still ran from the distant, scenic Posillipo height all the way into the grounds of the Mostra, itself; or maybe when the spectacular outdoor theater, the Arena, was open and you could watch a full-scale production of Aida under the stars. I have complained in these pages about the general decay that is part and parcel of the whole area in Fuorigrotta where the Mostra is located. I am still complaining, but perhaps there are better times ahead for this gigantic piece of real-estate way out "beyond the grotto," west of Naples proper. The grounds had little time to prosper; in June, 1940, scarcely one month after the Mostra opened, Italy was enmeshed in World War II, and the grounds were closed. The Mostra was adjacent to Bagnoli, site of a major steel mill as well as a large military base, and the grounds and buildings of the grand exposition were damaged by aerial bombardment during the war. After the Allies took Naples in September 1943, the Mostra was designated a medical center and became home to the US 21st and 23rd General Hospitals. The medical staff also occupied the nearby Agnano Thermal baths. 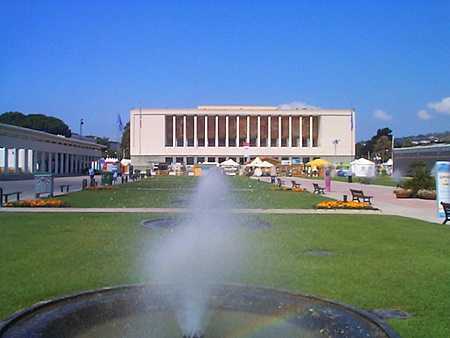 The construction boom of the 1950s and 60s was a dual-edged sword; it is true that there was effort to restore much of the artistic nucleus near the main entrance such as the large fountain and the theater. As a matter of fact, through the 1950s, summer productions of Aida were an annual event. On the other hand, there was further decline as land from the much larger original area was given over to needs more urgent than dedicating space to colonies that no longer existed. Also, the earthquake of 1980 caused massive displacement into the Mostra of persons with nowhere to live but in the container/shanty town set up on the grounds. The eastern end of the grounds, directly in front of Piazzale Tecchio had a brief renaissance in 1990 when that square and adjacent San Paolo stadium were rebuilt for the World Cup soccer matches. You could get onto the grounds, walk around, but there was no doubt that terminal rot had set in. 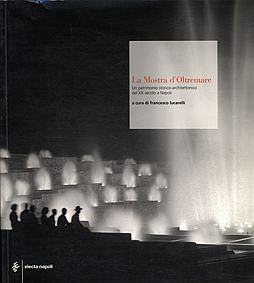 In 2001, the Mostra came under the tutelage of La Mostra d’Oltremare S.p.A, a corporation formed to rejuvenate the area. The project ties in with the development of the new campus for the University of Naples just up the road at Monte Sant'Angelo. At least the eastern end of the grounds are again used for major fairs and exhibits, such as the recently completed Home Show, a massive exhibit of household items arrayed in two exhibit halls on either side of the main concourse (top photo) leading up to the theater (also in operation). 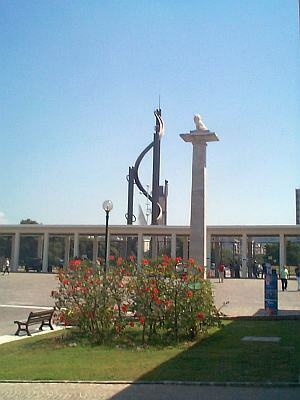 The square, Piazzale Tecchio, in front of the entrance is newly intact after years of major metropolitana construction to connect the nearby university with the main train lines into and out of Naples. The Arena is back in service and, indeed, has featured a recent production of Aida. Restoration is also underway on the large outdoor swimming pool and the beautiful Fontana esedra, a 100-meter-long, terraced cascade fountain surrounded by a shaded promenade. b&w photo of the main fountain from 1940. In 2005, the Mostra made a big to-do about applying to be placed on a Modern Heritage adjunct to the UNESCO World Heritage list "...that focuses on raising awareness concerning the heritage of architecture, town planning and landscape design of the 19th and 20th centuries." The problem with that is that there was no such list in 2005 and there is still none (although there have been UNESCO conferences about it since 2003). There was a week-long conference in 2005 in Naples about the significance of the Mostra called L’architettura moderna e il Patrimonio Mondiale. Il ruolo dell’Unesco e la Modern Heritage List [Modern Architecture and World Patrimony. The Role of UNESCO and the Modern Heritage List]. There was even a book, really a conference catalog (Electa, Naples, image, right). The conference concluded that besides being a mammoth display of colonialist prowess —if not braggadocio— the Mostra had indeed been one of the grandest examples in Italy of urban renewal, design and architecture. In fairness, it was impressive. Besides the main grounds of the Mostra, itself, the entire area to the east, virtually all of the town of Fuorigrotta was rebuilt to facilitate passage to the Mostra —new building complexes, new streets, etc.— all that. In any event, the Mostra d'Oltremare is not currently on the World Heritage list nor is it even on the list of tentative sites (those that have applied and are under consideration) and not even on the proposed Modern Heritage list (which, in fact, does exist). the Mostra on opening day, 1940. 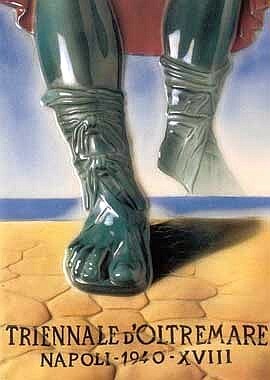 I'm not sure what this means; that is, it may be that the Mostra is not that big a deal. (In grandiosity, it pales beside the Risanamento, the 30-year reconstruction of Naples at the end of the 19th and beginning of the 20th century. The Mostra was even smaller than other Fascist projects of the 1920s and '30s, for example, draining the Pontine Marshes (between Naples and Rome) and building modern towns in their place. It may have something to do with the fact that the 2005 conference in Naples was not sanctioned by UNESCO (which had its own conference on Modern Heritage that year in Alexandria). The Naples conference was organized by local architects to talk about UNESCO, and maybe that is something that one simply doesn't do. But that sounds petty; after all, UNESCO "...sincerely hopes that other organisations will emerge in the near future, caring for other significant expressions of the diverse architectural heritage of the 20th century. We are always pleased to advise those interested in starting such an organisation." My gut says that it's political, by which I mean "politically correct." It is not a slight against individual architects who worked under Fascism; they produced Italian Rationalist buildings, an important contribution to 20th-century architecture (see entry on Fascist Architecture). (Indeed, one of the proposals in Italy for the Modern Heritage list is the former Casa del Fascio (the HQ of the Fascist party) in the town of Como, architect, Giuseppe Terragni, built between 1928 and 1936, the heart of the Fascist period. There are many buildings in Italy that would fit that bill, some of them in Naples. There are even many examples of general urban renewal that would pass muster. BUT the problem here is that we are talking about the totality of the Mostra; it was designed to be a mammoth tribute to colonialism. Perhaps that is simply something that one does not praise, no matter how deserving the architecture.